If you’re ready, or considering, starting an Instagram account for your library then you should find this post useful! I have put together some questions that you should consider before you pitch starting an Instagram account for your organisation. Who manages your library Instagram account can be a tricky question within our organisations. Whoever they are, they will be responsible for managing the image of your library and the gatekeeper for what is allowed to be posted on Instagram. Do you already have a marketing/communications person or team? Will there be one person in charge of the account or a team? Should the account be managed by an admin/office or branch based person or team? When you run a work account there are many things that need to be considered to ensure that it is sustainable and manageable. It takes time to manage an Instagram account properly and there are considerations before you launch that account. Will you be posting live or pre-scheduling posts using a social media management platform? How will you be managing the account outside of work hours? Will you be responding to comments and tags on weekends? Will you be taking photo submissions from staff across the library service? How will you ensure these photos are received in a timely manner? How will you be reporting? What you decide to post on your Instagram account depends on what type of library you have and what type of library members you are trying to appeal to. Think about what your library has to offer, what would be of interest to your members and potential members and what you want your public image to be. Whatever you decide to focus on, keep it consistent. Remember that depending on your workplace, you may need to have signed photo consent forms from the people in your photos. You need to know what your organisational rules are around this and ensure you have appropriate forms on hand, a procedure for storing these records and staff are aware of requirements. The most important thing about success on Instagram is ensuring that you have high quality photos because you want to be showcasing your library at its best and this can only be done with aesthetically pleasing photos. Hashtags are the most effective way for potential followers to discover you on social media and you need to be using them. When a user searches or clicks on a hashtag they are more likely to find you! The more specific you can get with your hashtags, the more targeted your audience will be and a targeted audience generally means better engagement, and better engagement is likely to mean more library members. Choosing which hashtags to use depends on what you want to achieve from your Instagram account, where your library is and what your library does. What do you want to achieve – Let’s be honest. Some people just want to have a big follower number and if this is your library then make sure you have a really pretty feed and use very general hashtags such as #bookface #amreading #bookstagram. This will get your follower number up but don’t expect those followers to turn into library members because they could be from anywhere around the world. However, if you want real followers who are real library members then you need to be more strategic with what and where your library is and who your library members are. Where is your library – Consider where your library is located and use local hashtags. Think about it, if you are a public library then you need to be reaching If your library is in Brisbane then consider using #brisbane related hashtags. What does your library do – Every hashtag that you choose should relate to what your library does and how potential library members would discover you. For example, if your library does children’s programs then you should consider using hashtags like #brisbanemums #brisbanemumsandbubs #brisbanefamilies. Also think about how you can tap into local events and use their hashtags. To really nail your hashtags you need to spend time researching which ones are right for your library. Spend some time searching for different hashtags, see what other libraries and local businesses are using and ask people how they would search for you. Doing your research will really pay off! 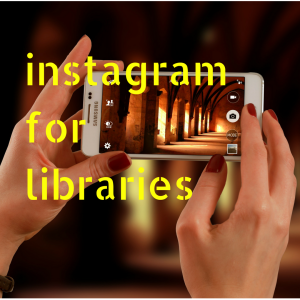 I hope these tips help you launch into the world of Instagram for libraries! I’d love to know what your tips for managing a work account are, leave me a comment!